Yesterday afternoon Venezuelan President Hugo Chávez passed away, after a long battle with cancer. The announcement by Vice President Nicolás Maduro came just minutes after Chávez's death and elicited an immediate wave of obituary pieces by pundits who described Chávez as "divisive", "authoritarian", "antagonistic" and "anti-American", many of them eager to rush the "transition" in the hopes that Chávez's political project would soon fall apart. In stark contrast with these predictable characterizations and demonization of Chávez in the major media is the response that Chávez's death has elicited from his peers, fellow presidents from throughout the Americas. Tributes, messages of solidarity and heartfelt condolences came in from Central and South America, reaffirming support for the ideals of regional unity and independence promoted by Hugo Chávez during his 14 years as president of Venezuela. Very few media outlets noted the outpouring of sympathy from Latin American leaders. "He is more alive than ever, and will keep being the inspiration for all people fighting for liberation," were the words of president of Bolivia, Evo Morales. With his voice cracking and struggling to speak, Morales said that he was "hurt, devastated," by the death of his "compañero and brother." And repeatedly referred to the liberation of South America forged by Chávez saying that, "the best way to remember him is with unity, unity." "Death is always felt, but when it is the death of a great fighter, one that I once defined as the most generous governor that I have ever met, the pain is on another dimension... Its magnitude is bigger than the loss." A somber and saddened Juan Manuel Santos, President of Colombia, emphasized Chávez's contributions in the peace process between the Colombian government and the FARC (Revolutionary Armed Forces of Colombia) saying that, "If we have moved forward with a solid peace process, with clear and concrete progress, with progress that had never before been reached, it's also thanks to the unlimited dedication and commitment of President Hugo Chávez and the government of Venezuela." Santos pointed out that, "the best tribute is to fulfill the dream of ending the conflict and seeing peace in Colombia." "We will accompany you as you have accompanied us," he added, reassuring the neighboring nation of what they already know: that cooperation and solidarity between the two neighbors is not in dispute. Santos also honored Chávez's commitment to peace in Colombia by saying that, "he always said that it is what Bolívar wanted, he was completely right." "I am proud to have lived and worked with him for the integration of Latin America and for a more just world," said a press release from Lula. His "love for his country" and "dedication" to "the cause of the poor will continue illuminating the future of Venezuela." President Rousseff highlighted her fondness and affection for Chávez and Brazil's friendship with Venezuela: "today, as always, we recognize in him a great leader, an irreparable loss, and above all, a friend of Brazil and its people." To a group of farmers that she was meeting with at the time of his passing, she commented that Chávez was "a man who was generous with all of those who, on this continent, needed him." Rafeal Correa, President of Ecuador, called Chávez "a great Latin American, a great human being" who "the whole world will recognize for greatness and courage." He added, "Those who die for life cannot be said to be dead. 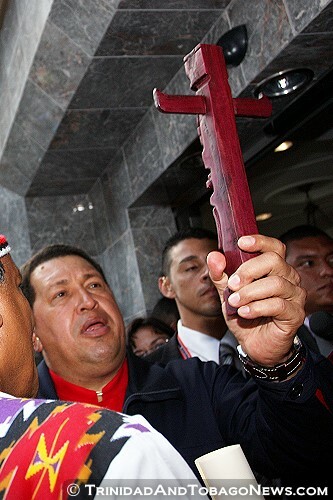 Hugo Chávez died for the life of his beloved Venezuela, for the life of a unified Latin America. He will be more alive than ever." Fidel Castro's brother and president of Cuba, Raúl Castro, said that Chávez's "Bolivarian Revolution" was "irreversible" and that Cuba would continue to "accompany Venezuelans in their struggles." Salvadoran president, Mauricio Funes gave his deepest condolences, and added that the death of Chávez will "produce a vacuum in politics, but most of all, in the heart of Venezuelan men and women." "During his 14-year tenure, Chávez joined other leaders in Latin America and the Caribbean to create new forms of integration. Venezuelan poverty rates were cut in half, and millions received identification documents for the first time, allowing them to participate more effectively in their country's economic and political life." But in stark contrast to the heartfelt condolences and tributes from Central and South America, responses from President Barack Obama and Canadian Prime Minister Stephen Harper came off as contemptful of Chávez, certainly consistent with past attitudes of both governments towards Venezuela and South America's growing independence. Unsurprisingly, Obama differed in tone from his peers to the south, offering no condolences and focusing instead on ushering in a "new chapter in [Venezuelan] history" and pushing the hackneyed talking point that "the United States remains committed to policies that promote the democratic principles, the rule of law, and respect for human rights" as if there were a significant deficit of any of these things in Venezuela. It is conspicuous that unlike other world leaders, Obama did not express condolences. This will almost certainly not go unnoticed in Venezuela or Latin America, more widely. Canadian Prime Minister Stephen Harper essentially repeated Obama's message, but with the addition of "freedom" to the list of principles to "support" and "promote" in Venezuela. But these statements from the hemispheric north do not represent the general regional attitude towards Chávez's death. The heartfelt acknowledgement of Hugo Chávez's regional integration agenda and leadership qualities expressed by the overwhelming majority of the leaders in the Americas, and not only by its left-leaning leaders, make clear the impact that Chávez has had on the region. Yesterday, Latin America voiced a clear affirmation that, even in the absence of Chávez, it would continue to work together to forge ahead with the ideals of Latin American unity and independence that have already become a reality.